In an untitled film made in Philippe Vandenberg’s studio, teeming with painted text-based declarations, this –the Serenity Prayer– was the only written content outside of the artist’s dialogue to be extracted and translated in subtitles. It’s a striking moment. The prayer appears across the bottom of a monitor in English, midway through the film, on the third floor of Hauser & Wirth in the Upper East Side during the exhibition, Philippe Vandenberg. Made in January 2009, it features Vandenberg going through his massive studio, in the arduous process of documenting and archiving works from his oeuvre. Prolific, is almost too brusque a word to describe the artist’s career. Paintings reveal a constant evaluation and reevaluation of life as we know it, evident in the many works on view in the gallery. The exhibition at Hauser & Wirth was curated by Anthony Huberman, director of the CCA Wattis Institute for Contemporary Art who elegantly installed along with the video, paintings and drawings from 2006 through 2009. In truly living his rigorous practice, Vandenberg also suffered from depression which eventually led him to take his own life in June 2009 at 57 years old. Having been a peer of Mike Kelley who also committed suicide at age 57, it is revealing to see the stylistic similarities and differences as both men not only struggled with the cloud of darkness that is depression, but simultaneously the lust and vigor for newness associated with life. Thematically, Philippe Vandenberg dove head first into political, comedic, and romantic obsession all brought to life through the veil of process. He used drawing as a tool to communicate through lines that formed a recognizable object or when placed together: words. Multilingual, he used language as just another way to interact with a particular surface, writing in Dutch, Spanish, French and English his texts are narrative, revealing and at times abstract components generated solely to make a drawing. Yet, when comprehending the language used, his life, sense of humor and sadness leaps off of the surface in a visceral way. Such is the case with an untitled pastel drawing made directly on top of a reproduction on paper. The image is of a painting portraying a landscape with sheep, that the artist found. Boldly declaring in all capital letters, “BRING THEM ALL TO MY KITCHEN” Vandenberg exposes hunger, humor and the absurdist characteristic of the unattainable. A flock of sheep accompanied by a shepherd, is not only a peaceful –if not banal– scene to take in, yet also a Christian symbol; we are the flock, Jesus is the shepherd. At first glance the work lives on the surface, but in fact is layered and defaced in order to satisfy a larger intention. His specificity of line work is undeniable, and while somewhat child-like, skillful in its direct sense of purpose. The piece is striking and surprisingly fresh. 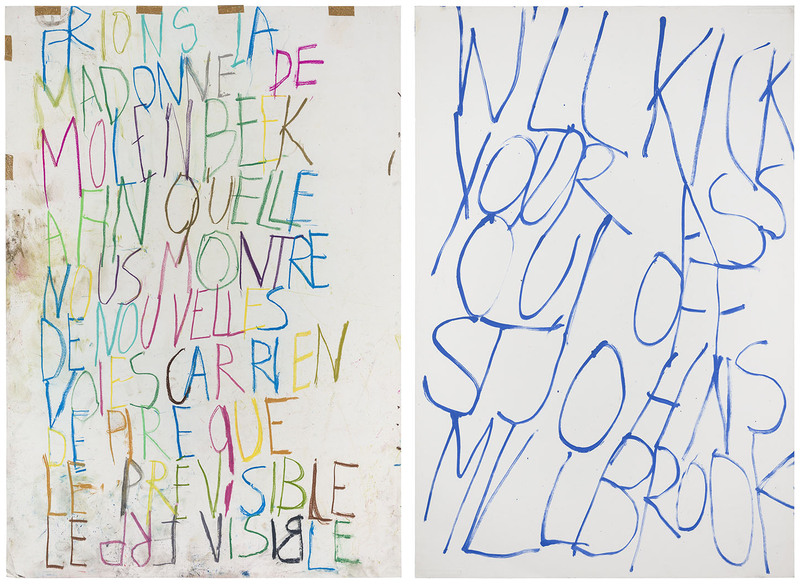 While perhaps nodding towards the numerous written gestures of artists such as Cy Twombly and Jean-Michel Basquiat, Philippe Vandenberg used words differently. Through his interlacing of foreign and native languages, this proposed narrative can be looked at as an open portal into the man’s life and simultaneously, just a picture meant to be looked at. The multiple drawings and paintings at Hauser & Wirth, are both accessible or inaccessible based on linguistic and historical comprehension of the viewer. Although having spent time outside of his native Belgium, Vandenberg didn’t have the recognition or reputation in the United States that many other artists of his generation did and still do. At first exhibition in the US in 1986, one of his paintings was acquired by the Guggenheim, but somehow his visibility remained minimal. At Hauser & Wirth, Huberman curated a comprehensive selection of works from the later part of his short life, 2006-2009, not only bringing to light the extent of Vandenberg’s career, but also installed in a way that actually allows his gestures to be looked at, experienced. There is no doubt that the work is a celebration as much as it is an effigy. Playing an important role in sustaining, promoting and supporting their late father’s legacy, Vandenberg’s three children along with exclusive representation at Hauser & Wirth, have taken on the task. In losing their father, an art historian, a filmmaker and architect each contribute to his exhibitions in various ways. His middle son Guillaume made the 2009 film on view, documenting his father who he described as “tired” in the studio. His youngest son, Mo, constructed and designed the tables used to house drawings which were removed from one sketchbook. Vandenberg’s eldest, his daughter Hélène, worked with Anthony Huberman selecting works to be exhibited. The Estate of Philippe Vandenberg, as with all artists’ estates, is one that is meant to be nurtured. A family affair, the offspring were left with this mission and have wholeheartedly embraced it even admitting that in the end, “he destroyed himself”. Having studied philosophy, unsurprisingly Vandenberg was initially interested in being a writer before embarking on his career as an artist. Unconcerned with labels, he wanted people to look at his work as an artist and not focus on the technique or the identification of one being an abstract or figurative painter. Consistently working in the studio, Hélène described her father’s frenetic process as “always drawing and writing” and a true “artist’s artist”. Huberman and Hélène worked together on what she says is the visible “mirror of thoughts” her father had. A series of 110 drawings from a singular sketchbook were made in a three-day frenzy of non-stop drawing. The works vary conceptually, referencing motifs from the artist’s life and time, ranging from the death of his father to current news events including Fidel Castro. Observing the numerous sketches, language and color shift as easily as the gesture of the line. It is in this series, where his repetitive “no drinking alcohol, no drinking alcohol, no drinking alcohol” is exposed, along with a vulnerability that Hélène describes both as “fragile and tough”. Struggling with an existential and emotional malady, Vandenberg used his hand and his mark to comment in a spontaneously planned way, highlighting not only his own difficulties but housing a gem of political unrest that was happening during his lifetime not only in Belgium but with a comprehensive global sweep. Spread over three floors of the 69th street brownstone, Philippe Vandenberg is a slow and meditative show. 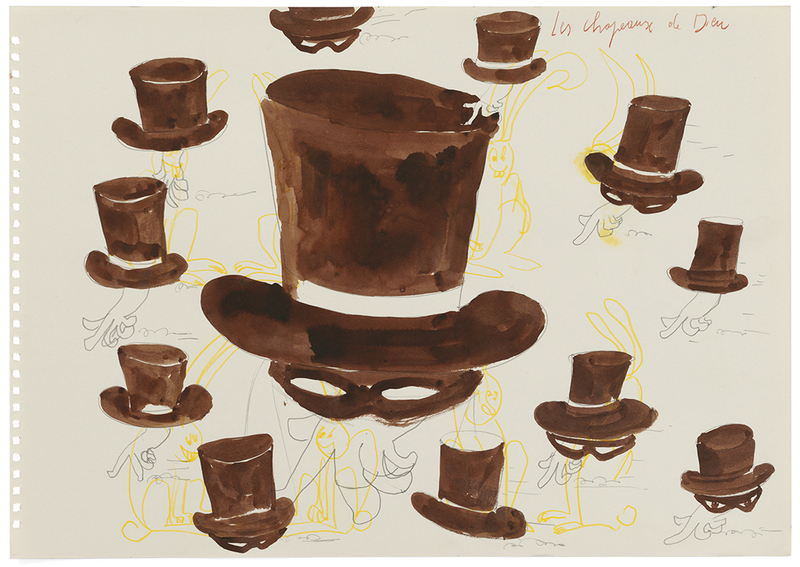 Highlighting work from the end of his life, the exhibition is a survey of a man who was always in a state of motion. This is evident from his marks, erasure and reapplication of paint in works that document time even after the maker is gone. 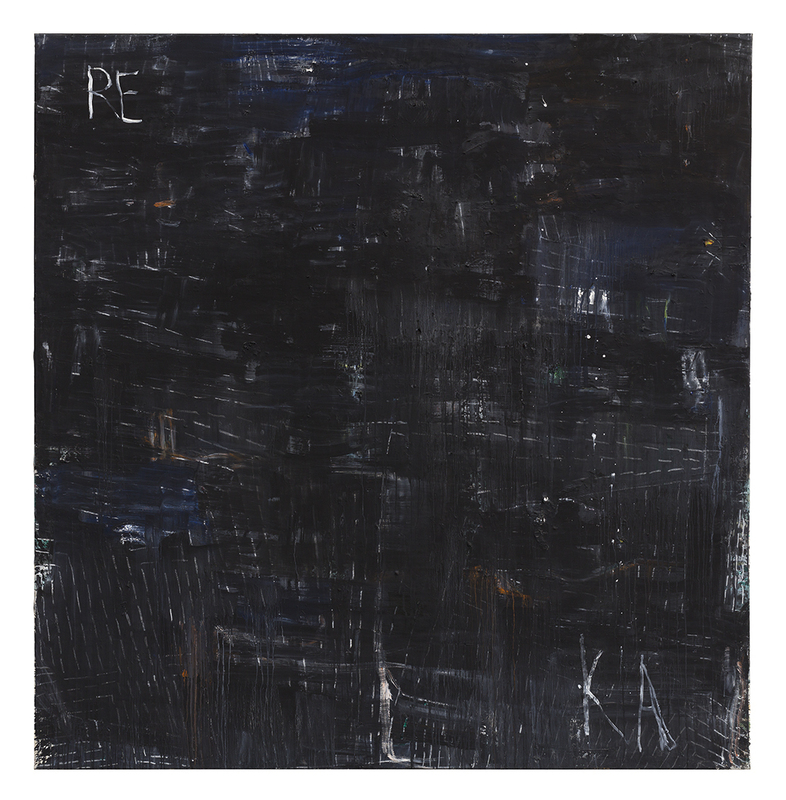 Stylistically relevant today, his work is in dialogue with Abstract Expressionism, Pop-Art and that gritty private space of an artist’s soul that many of us never get to see. His sketchbooks were both a practice venue and the finalé. Unlike most art made for the digital age, his is art that will stay with you at the core, long after the Instagram story has expired. Philippe Vandenberg opened Jun 27 and is on view until July 28, 2017 at Hauser & Wirth Gallery, New York. *Author’s note: I am still researching documentation if both Goya and Rembrandt committed suicide.